Action Hero Biju Review – Action Hero Biju is a Malayalam drama film released in 2016. The story revolves around the daily life of a local town sub-inspector in Kerala. The movies title and trailer are a bit misleading for it to be a typical commercial cop drama. However the tagline “A ride with a police officer” is a more apt title. Nivin Pauly had switched gears after the blockbuster Premam to do a realistic cop drama. The word realistic is key because the movie is very simple and revolves around the day to day life of a cop. After watching the movie for 140 minutes you get a feeling of having been a spectator in a police station. You see the police officer trying to resolve the cases, adamant to not to submit before power, deal with emotional situations with a straight face as it is a routine, enjoy the music played by a convict. The conflicts are not dramatic like any other movie. Barring the last fight sequence, the movie is a sincere attempt to pay tribute to the cops. The best part of the movie is the screenplay. It is almost like a theater where the next set of characters arrive to perform on the stage once the previous ones are done. Here the police station is like a stage. You see a plethora of characters including a local drug dealer, a stalker, a nuisance creator in public, a separated couple, a human right activist, a spoilt rich man to mention a few. Each of the characters adds an interesting facet to the narration. In many parts, you see parallel tracks going on a different case and each of them gets a logical resolution. The start of the movie creates the necessary suspense needed to glue the audience to the seat. High Points: A sincere screenplay without any frills, Nivin Pauly’s performance as sub-inspector Biju, character sketches in various cases. Low Points: I want to leave this blank to laud the effort of an honest film. Overall Action Hero Biju is a movie for all movie buffs. The makers have proved how you can make an interesting movie without falling into the fray of items forced in for commercial reasons. I would recommend this to be a Must watch for the sincere script. 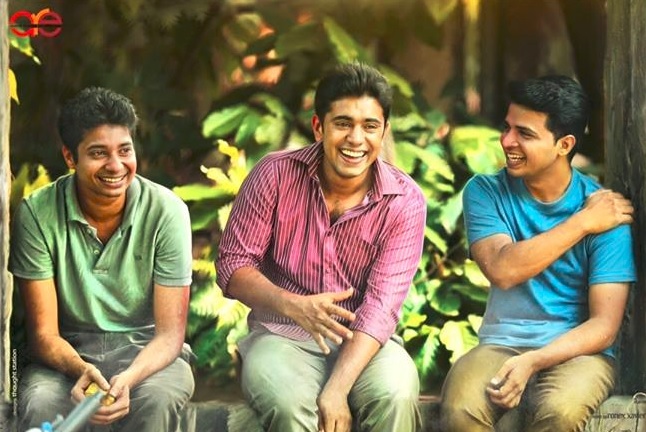 Jacobinte Swargarajyam Review – Jacobinte Swargarajyam is Malayalam family drama released in 2016. Jacob lives a very happy life with his family in Dubai. But as one of his business partner cheats him he has to flee to Liberia to avoid getting arrested and his son Jerry has to step in to pull the family out of crisis. The movie is based on a true story. Director Vineeth Sreenivasan has attempted honestly to portray this as a family entertainer on screen. His effort needs to be lauded. The movie begins with sequences that are loaded with too many positives that it starts to become a cloying in some time. However once the characters are faced with the core problem it becomes very engaging. Off late there are very less number of movies based on core family values are getting released. It was once very popular in the South film industry when likes of director Visu and V.Shekhar were making movies. It is definitely refreshing to see a movie built on family values after a long time. And to everyone’s surprise, it still works well with the audience. The first half of the movie belongs to Renji Panicker and his character is built very well in front of the audience. Nivin Pauly has a lot of scope in the second half. This movie is in quiet contrast to Premam for Nivin Pauly, where he has to underplay for his character and does not bring out his heroism. Even in the scene where he and his brother pick a fight with the neighbor Nivin stays at the side to watch it. This is so true to the definition of the Jerry’s character being played. Nivin, stay like this forever and don’t fall into the fray of becoming a mass hero who is only destined to bash bad guys. Lakshmi Ramakrishnan has a very powerful role to play in the movie as well. She is the portrayal of woman power in the movie. High Points: The movie based on a true incident, a plot revolving around core family values, Performance from Renji Panicker. Low Points: Cloying screenplay at the first 20 minutes or so. There are lot of positives in Jacob’s kingdom of heaven. Go with your family and you would enjoy this one more. Aviyal Review – Aviyal is a Tamil anthology film released in 2016. This movie is a bouquet of four Tamil short films directed by different directors. Anthology films are a boon to the film industry for multiple reasons. It gives opportunities for new talents to work with well-established artists. It also gives opportunities for well-established artists to experiment something new with a lesser risk compared to a full-length feature film. Aviyal is one such movie. Although the plot lines are something we might have seen or heard before, the treatment is fresh. Each of the four stories engages well with the audience. And as a special treat, the last one is directed by Alphonse Putharen starring Nivin Pauly and Bobby Simha. I couldn’t pinpoint one movie to be better than the other as all the stories were equally good. Indian government should support such anthology films to help identify and nurture new talents. This also serves as a platform to test some new treatment and genres with the audience, which can go a long way in making the quality of films better and profitable. High Points: Short and enjoyable tale with a good sense of humor, Good performances from some of the new-comers. The short film by Alphonse Putharen starring Nivin Pauly and Bobby Simha stands out due to the star cast and narrative style. Low Points: The movie was promoted with Nivin Pauly and Bobby Simha so people coming in for them would be disappointed as they feature only in the last film. The length of the movies could have been maintained at 20 mins to make it more engaging. Overall Aviyal is tasty with all vegetables cooked well to give some true flavours. It also stays true to its recipe by not including too much masala. Support good cinema and budding talents by watching this one. Om Shanthi Oshaana – is a Malayalam romantic comedy released in 2014. The story revolves around a girl who falls in love with a guy in her teens. The guy doesn’t accept her love as she is still a kid. She waits six long years till she is on her own and completes her degree. Was she able to get the guy of her dreams is the plot of Om Shanthi Oshaana. The plot is a very old one and has been dealt in numerous movies. Certain plots are like a fresh coffee in the morning… no matter how many years you had been having it, the first sip in the morning always tastes fresh. Only thing to take care is to make the coffee right. Director Jude Anthany Joseph with his fresh screenplay has made a perfect blend. Being his first full length movie he hasn’t compromised on the elements of his plot. Nazriya is cute with her performance and the story sails around her. Nivin Pauly has given a much matured performance and the Neram pair strikes gold again with their onscreen chemistry. All the characters you meet are positive, “there is a cool breeze, general warmth and greenery” (you will understand this phrase once you see the movie) throughout the movie. It is one of the movies where even the sad scenes look beautiful. While people are struggling hard to make something big, innovative and out of the world love stories… this one comes with simple, beautiful and down to earth love story. If you are girl kid of the 90’s you will have more things to relate in the movie. The dialogues are witty and makes you laugh at many places. Overall the movie is right for the season and it is a feel-good entertainer throughout.